These solar power systems are grid-connected and are commonly found where the electric grid is available. They are designed to be stabilized by the grid such that any excess power from the solar power system is routed into the electric grid for compensation by the utility company through a process called net-metering. In net metering, a bi-directional meter is connected to the solar power system and the utility grid to measure electricity flows from both the grid and the PV system. Because the availability of the sun is limited to during the da, this means at night, unless connected to batteries, the utility grid stabilizes your solar power system. As a result, the bi-directional meter will move forward at night when you are consuming power from the grid and backwards during the day when you are producing your own solar power. 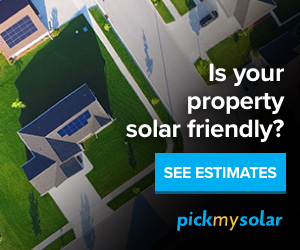 If you are interested in learning more about how much a grid-tied solar power system will cost you, check out this solar panel cost calculator from the EnergySage for more details. For homeowners, depending on the size of your home (i.e. how many bedrooms you have) you may want to consider the cost, quality, financing, type, size and brand of the solar panels that you intend to install. The number of bedrooms in a house does not necessary correspond to the size of your solar power system, but the amount of energy consumed in your household will determine this. The size of the solar power system for your home is dependent on the electricity load or the number of appliances you generally use. The amount of energy consumption for your house helps to determine whether you need a 5kW, 6kW or a 10kW solar power system. In the USA, the average three bedroom home will require roughly 6,000 Watts (6kW) – about 20 solar panels- and this can cost between $18,000 to $22,000 before any tax credits or rebates. Typically, the following can guide you about the size of the solar power system you need depending on how many bedrooms you have in your house i.e. To get more accurate data, in terms of the solar power system size, cost and the number of solar panels you may need for your household, use this solar panel cost calculator from the EnergySage to help you to get started in the right direction. Finding the right solar panels or solar power system will depend on very many factors, including the cost, quality, financing, type, size or brand of the solar panels used. If you are not sure what solar power system or solar panels that you are interested, you can check the EnergySage Online Solar Marketplace that will present you with the best prices possible as well as a platform that you can help you compare, contrast solar panels while getting pre-screened solar installers in your local area. Learn more at EnergySage. General household: Air conditioner, ceiling fan, radio/phone transmit. Kitchen appliances: Refrigerator/freezer, electric oven, coffee pot, dishwasher, microwave. Entertainment: cellular telephone, computer printer, computer (desktop), computer (laptop), TV. Tools: Drill, electric mower, weed eater. Enter in the daily usage for the above appliances on the off-grid load calculator to see how much energy is used. Once you figure out this then you can get a free quote for an off-grid solar power system for you. Backup solar generators are generally used when there are power blackouts or power outages. You can learn more about backup solar generators at Earthtech products.